Social ministries bring Jesus into our everyday life through shared experience. One of the central ways we grow as disciples of Jesus is by having intentional relationships with people. Sunday Social Hour is the ideal place for that! During Sunday Social Hour people gather to share in food and fellowship as a means of pursuing spiritual growth and healthy relationships. Sunday Social Hour can also help people find the ministry within which to serve or be a part of. Each Sunday, a group hosts Sunday Social Hour. During Sunday Social Hour, the group will serve coffee and donut— but not just coffee and donut. The group leaders and members will also share their ministry mission and vision with the faithful. It is an opportunity to get to know the heart of the various ministries active in parish life at Saint Patrick Catholic Church and find one that is best suited for you— one that matches the gifts and talents that God graced you with. We invite you to take part in this great mission! To learn more about specific groups, please follow the ministry links to the right on the website or contact the Parish Center for additional information about the ministry or join us for Sunday Social Hour so that you can learn about ministries first hand from ministry leaders and members while engaging in fellowship with the parish faith community. Sunday Social Hour is more than just coffee and donuts. Would your ministry or program like to host Sunday Social Hour? 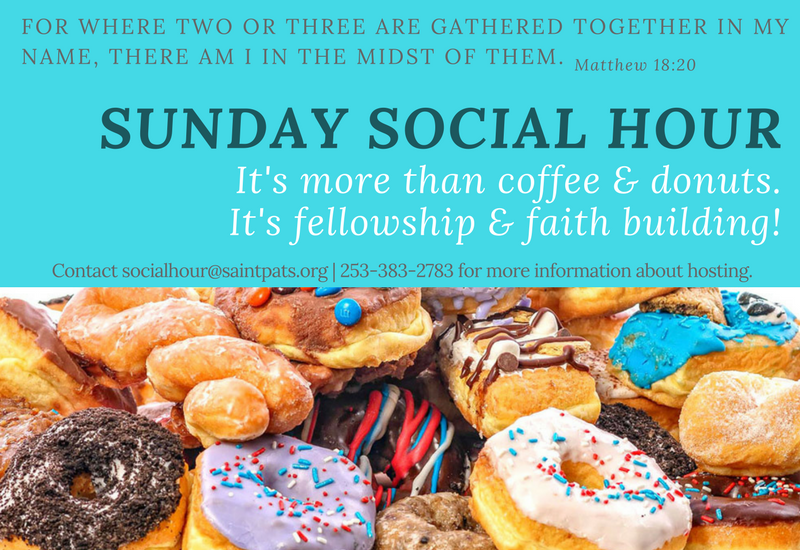 Families are invited to host Sunday Social Hour too— what a wonderful way for families to share in fellowship with their parish faith community. A team of families can collaborate to host. There is no cost to you— but the fulfillment experienced in serving others is tremendous. I would like to host or help with Sunday Social Hour!